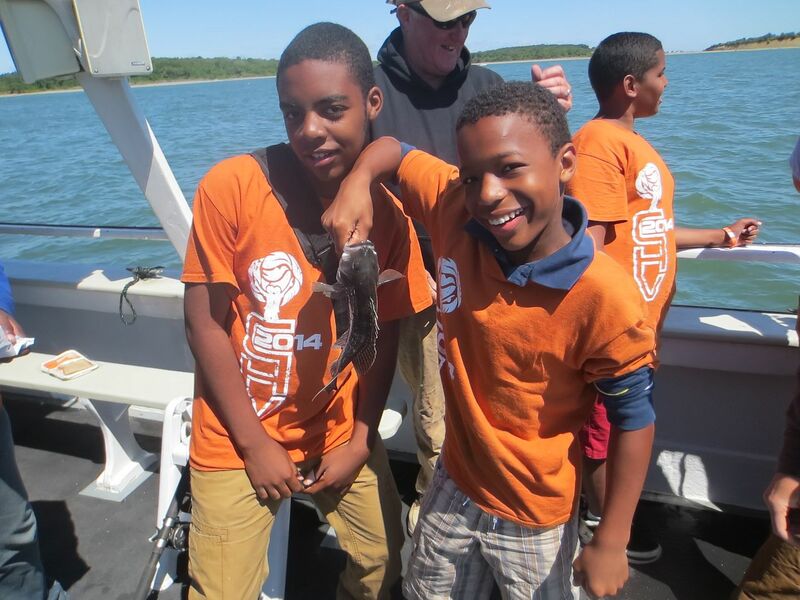 Yesterday we had our annual fishing trip for the kids of Camp Harbor View. It was a blast to see the kids sprint on to the boat filled with excitement. It was also nice to know that we were sharing a very special moment with some of them as this was some of the kids first time on a boat ever. The ones who had never been on a boat were the most excited and the most anxious to go out to sea. Once we had everyone on board we bated up the rods and Captain Charlie brought us out to a few of his special fishing spots where we were able to catch dozens of fish. It was a great day to be out on the water also with the slight breeze and the sun being out, not to hot but at the perfect level of summer comfort. Once we began catching fish everyone was excited and wanted to hold one, or take a picture with it. Some of the children were so fascinated with the sand worms also, they thought they were amazing. Yesterday was a huge opportunity for us to give a unique experience in the lives of Boston youth and to give them an adventure they will surely never forget.